If you love almonds and enjoy the taste of almond flavoured baked goods then you’ll love these easy to make Chewy Almond Marzipan Bars! Marzipan is primarily made of finely ground almonds and sugar. It’s often used to make fruit shaped candy and decorations for cake. I find baked goods made with marzipan paste irresistible and have been wanting to bake with marzipan for some time. So when I saw this recipe for Almond Bars, I knew that I could tweak the recipe and add marzipan and almond flour for even more almond taste. 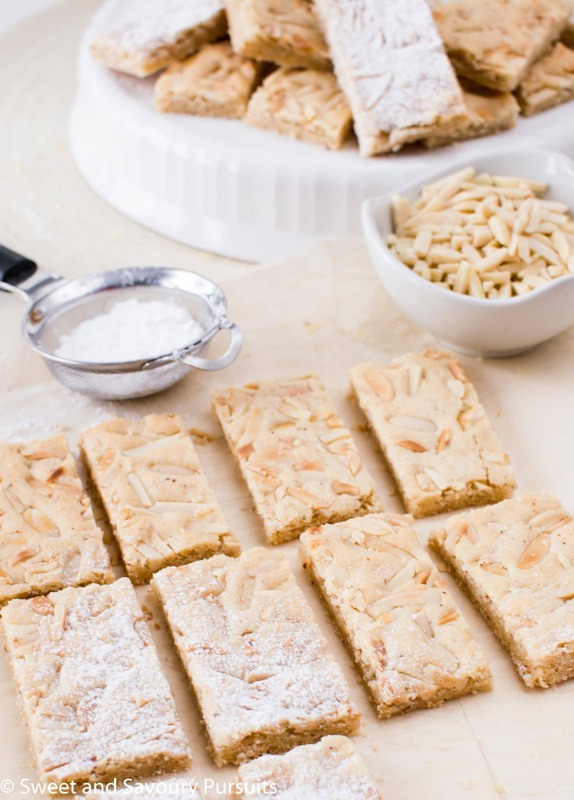 To make these almond cookie bars, I use both marzipan and almond flour. I bake them in a 9×13 baking pan lined with parchment paper, leaving an overhang on two opposite sides of the paper. This makes it easier to lift the bars out of the pan so that you can cut even slices. Including marzipan, almond flour and almond extract in the recipe ensures soft and chewy bars with the perfect amount of almond flavour. You could also make these almond marzipan cookies with a hint of citrus flavour. Just add half a teaspoon of grated lemon or orange zest to the batter. 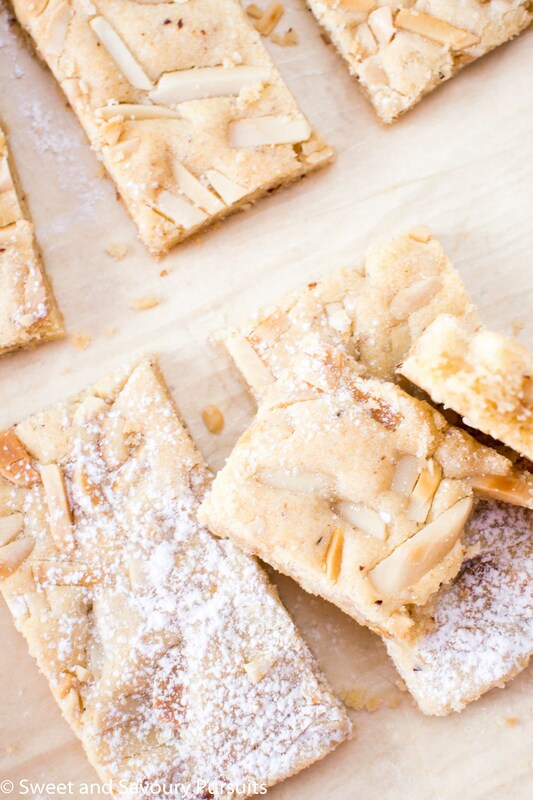 The taste of almonds really shines through in these Chewy Almond Marzipan Bars. They make a delicious treat and are so irresistible that I had to share them with friends and family so I wouldn’t eat them all. Enjoy! If you enjoy the taste of almond flavoured baked goods then you'll love these easy to make delicious Chewy Almond Marzipan Bars! Line a 9×13 baking pan with parchment paper, leaving an overhang on two opposite sides. In a medium bowl, combine the flour, almond flour, baking powder and salt, stir and set aside. In the bowl of your mixer, beat on medium speed the butter and the sugar, until the mixture is creamy. Add the marzipan and beat until the marzipan has been incorporated into the butter and sugar mixture and no lumps remain. Add the egg and the almond extract and then beat until the batter is light and fluffy. Beating on low speed, add the flour mixture and beat until incorporated to the batter. Evenly press the dough into the bottom of the lined pan. Using a pastry brush, brush the cream (or milk) on top of the dough. Sprinkle the dough with the toasted slivered almonds and lightly press them into the top. Bake for 18 min, or until just barely beginning to colour around the edges. The top should be dry to the touch. Over-baking these will yield crunchy cookies. Let them cool in the pan for 5 minutes and then using the overhang of the parchment paper, lift them out of the pan and put them on a wire rack to cool. Once cool, cut with a sharp knife into 18 pieces or more. If desired, dust them with a bit of powdered sugar. *Toast the slivered almonds in a 350ºF oven for about 10 minutes or until they begin to colour. Make sure to stir them after the initial 5 min. Put them back in the oven making sure to keep a watch on them. Once golden, remove from the oven and let them cool. This looks like my dream dessert/snack, etc. Can I use Almond Paste in stead of marzipan? Hello Roger, so glad you want to try this recipe, you won’t regret it! As long as there is some sugar in your almond paste, then it should be fine. Let me know how it goes! combo? 🙂 Were they very sweet? because marzipan usually is too sweet. Hi, thank you. No, they weren’t too sweet because I only used 1/3 of a cup of marzipan and I reduced the sugar in the original recipe by a third, so 2/3 cup of sugar. I didn’t find them overly sweet but they also didn’t need any powdered sugar to make them sweeter, that was more for the photos! They look incredible. Thanks for sharing. These look and sound wonderful! So pretty with the powdered sugar on top, too! I like to bake this cake but what is marzipan.It ‘s my first time to hear this ingredients. Thank you. Hello, marzipan is a combination of ground almonds and sugar. You can usually find it in the baking section. It should be plain and not covered in chocolate. This recipe is for making cookie bars. Lots of almonds!!! Such a wonderful recipe, love the idea of almond bars! Yes lots of almond flavour make these bars extra delicious! Thanks!